On Tuesday, Narendra Modi became the first ever Indian prime minister to visit Israel. On his arrival, Modi was given a special welcome -- accorded only to presidents of the United States and the Pope. In a break from protocol, Israeli Prime Minister Benjamin Netanyahu welcomed him at the airport and will travel with Modi for all his visits. In honour of the visiting PM, a flower in Israel has been named after him. 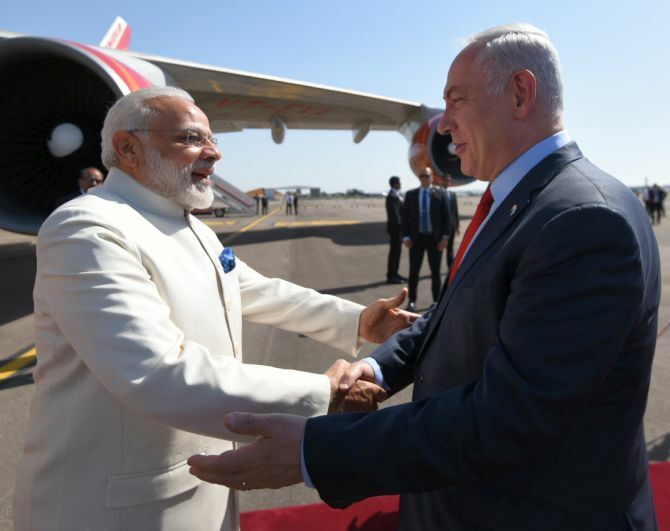 Netanyahu, who, in a special gesture, was present to receive Modi as he landed at Tel Aviv on Tuesday, welcomed the latter with ‘open arms’ and said that the country had been waiting for him for long. "My friend, Prime Minister Narendra Modi, welcome to Israel! Aapka swagat hai mere dost! prime minister, we have been waiting for you for a long time. Because yours is truly a historic visit. 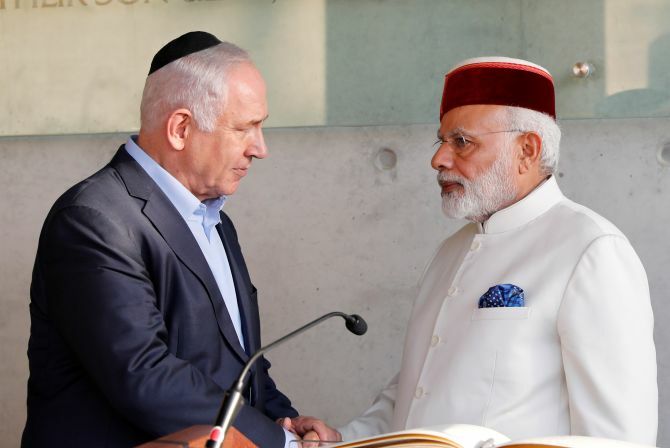 It’s the first time an Indian prime minister is visiting Israel. We receive you with open arms. We love India. We admire your culture. We admire your history, your democracy, and your commitment to progress,” Netanyahu said. Netanyahu hailed the cooperation that the two countries have been showing in the field of space. "Today, even our space programmes are working together to achieve even greater heights. The ties between our talented innovative people are natural. It’s so natural that we can ask what took so long for them to blossom,” he said. artnership because of the great sympathy between the people of the two nations and the natural camaraderie between them. Netanyahu described Prime Minister Modi as a great leader and a ‘world leader’. The Israeli prime minister said he and Modi both seek a better future for the people of the two countries. “It requires a lot of work, it won't happen overnight but prime minister Modi and I want this to happen,” he said. 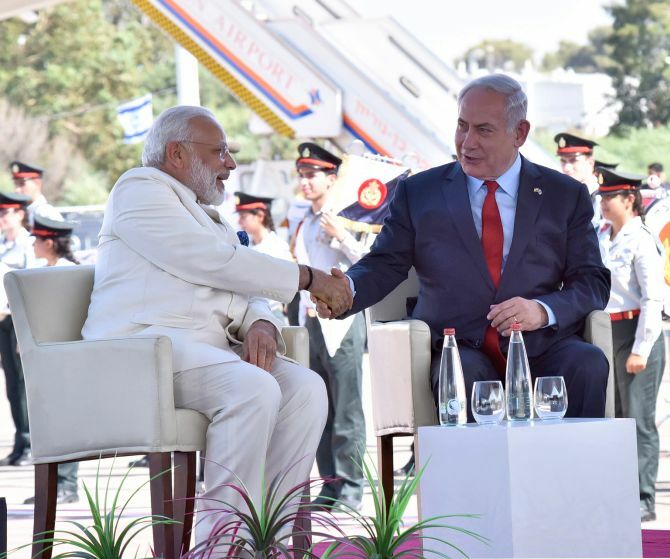 Netanyahu said he has been inspired by Prime Minister Modi's enthusiasm for Yoga and cited yogic asanas to link the two flourishing democracies of the world. ‘I have to confess that I have been inspired by Modi’s enthusiasm for Yoga,’ Netanyahu said in a press statement along with Modi. He also mentioned renowned Indian mathematician Srinivasa Ramanujan, saying that he symbolises the talent of people of India. He emphasised that the two countries believe in the partnership of talent. Expressing his admiration for Ramanujan, Netanyahu said he was one of the greatest mathematicians of all times. ‘We have a great admiration for people of India. I told you about my late uncle professor, who was a mathematician at the Israel Institute of Technology. He told me many times about his admiration for the great Indian mathematician Ramanujan,’ Netanyahu said in the statement. ‘He was perhaps the greatest mathematician in many centuries. And this symbolises the talent of people of India, as we know we have talent in Israel. We believe in this partnership of talent,’ he added. 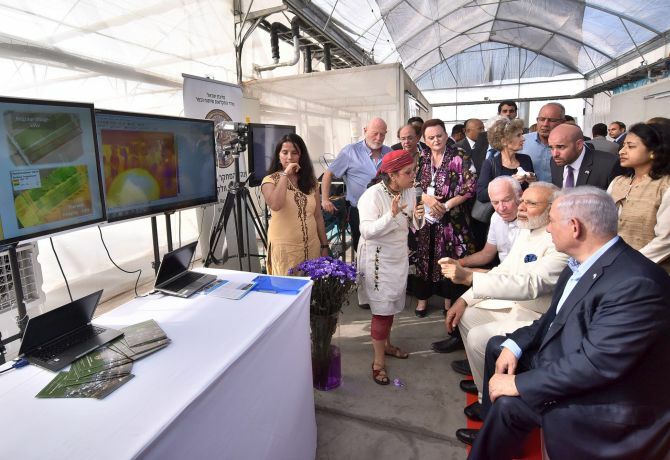 Soon after landing, Prime Minister Modi visited Danziger ‘Dan’ flower farm in Moshav Mishmar Hashiva along with Netanyahu and Agriculture Minister Uri Ariel to learn about latest innovations and advancements in floriculture. Here, it was announced that a new fast-growing Israeli Chrysanthemum flower would be named after the visiting Indian prime minister to honour him. ‘Crysanthumun flower will be named in honour of PM @narendramodi. The flower will be called 'Modi',’ tweeted the PMO. 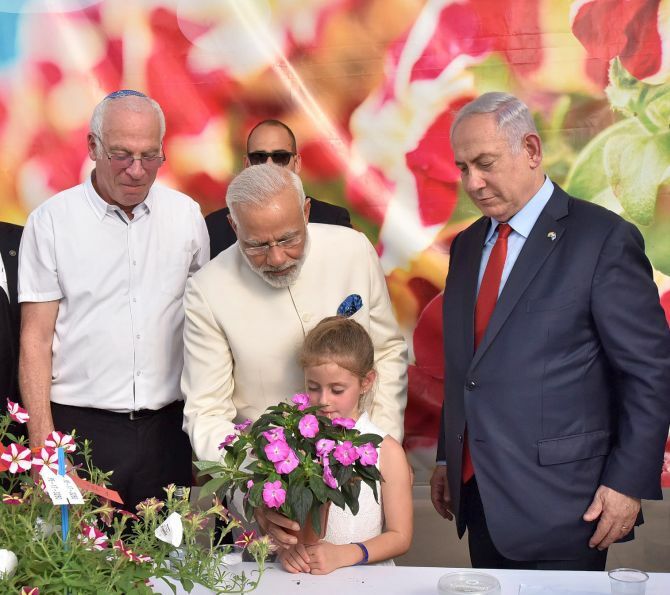 ‘Beginning with a focus on agriculture... Prime Minister Narendra Modi visits the Danziger Flower Farm,’ office of the Israeli PM said in a tweet. ‘At the Danziger Flower Farm, advanced agriculture technologies were showcased by the Israeli Government,’ it said in another tweet. ‘Reaffirming potential of deeper cooperation in Agriculture! Prime Ministers visit Danziger Flower farm – a leading facility for Research and Development in plant varieties,’ Ministry of External Affairs Spokesperson Gopal Baglay said in a tweet. The visit to the farm highlights that one of Israel's key interests in closer cooperation with India is its expertise in agricultural technology, officials said. “These people are doing remarkable things and you can increase the productivity of crops, of irrigation, of soil, livestock with the kind of groundbreaking research that they’re doing. One thing you haven't resolved is how to bring down the temperature in a greenhouse. It’s too costly,” Netanyahu said. Danziger flower farm developed into a company of 200 employee from a small family business, growing and selling cut flowers. 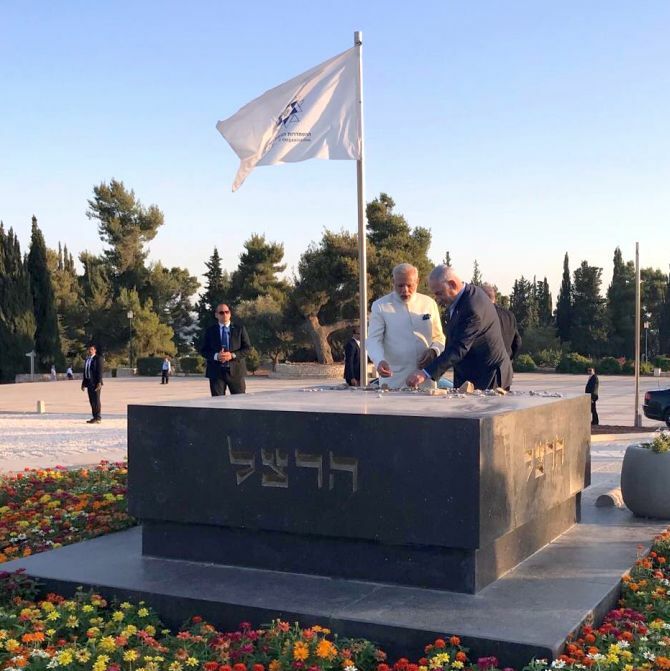 Prime Minister Modi also made an impromptu visit to the grave of Theodor Herzl, who is considered as the founding father of Zionism, at the suggestion of Netanyahu. 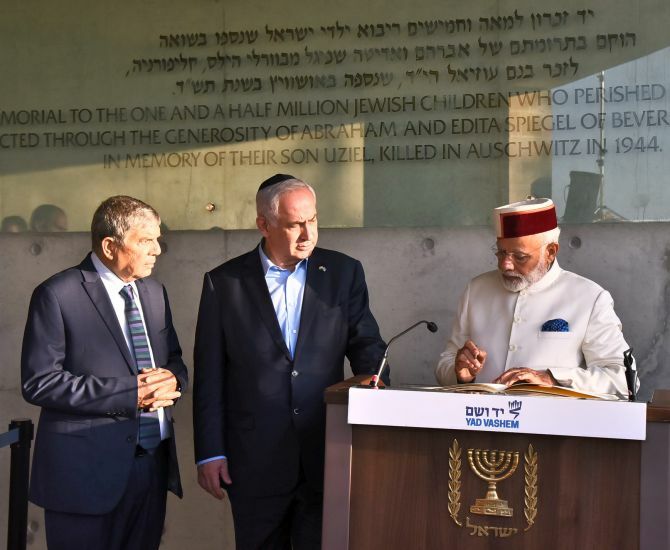 Modi, who visited the Yad Vashem Museum and honoured the victims of the Holocaust, was suggested by Netanyahu, apparently spontaneously, that they visit the grave of Herzl born Benjamin Ze’ev Herzl -- which lies adjacent to the memorial. 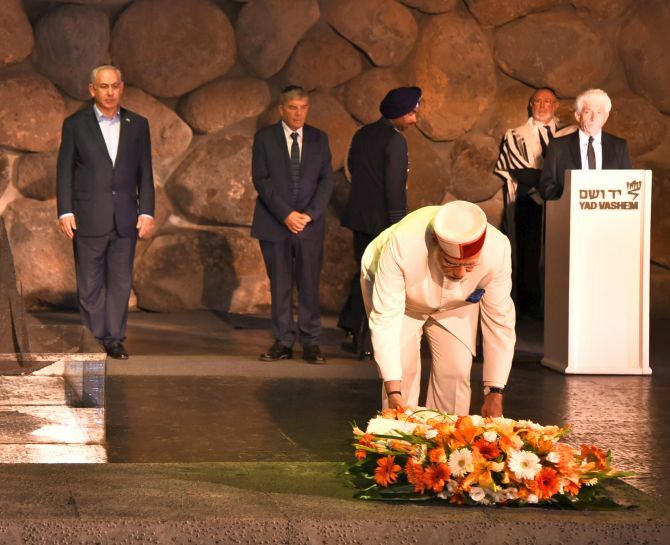 Prime Minister Modi agreed on the suggestion and the two leaders visited the marble tomb at Mt Herzl. Modi placed a small rock on the marble tomb as Netanyahu watched with a smile. ‘PM Netanyahu and @PMOIndia Modi visited Mt. Herzl in Jerusalem, and paid their respects to the founder of modern Zionism, Theodor Herzl,’ the official Twitter account of the Office of the Prime Minister of Israel tweeted. It also posted a brief video that showed Modi placing his hand on the tomb. ‘Before departing the Yad Vashem complex the leaders visited the Grave of Theodor Herzl -- Chozeh HaMedinah (lit ‘Visionary of the State’),’ Ministry of External Affairs spokesperson Gopal Baglay tweeted. Herzl was an Austro-Hungarian journalist, playwright, political activist, and writer who is considered the founding father of Zionism -- a movement to establish a Jewish homeland. They comprise two different sets of copper plates that are believed to have been inscribed in 9-10th Century, the Prime Minister's Office tweeted. The first set of copper plates is a cherished relic for the Cochin Jews in India. It is regarded as a charter describing the grant of hereditary royal privileges and prerogatives by the Hindu King, Cheraman Perumal (often identified as Bhaskara Ravi Varma) to the Jewish leader Joseph Rabban. Local Jews once placed in each coffin a handful of earth from Shingli/Cranganore that was remembered as a holy place and a 'second Jerusalem'. The replica of these plates was made possible with the cooperation of the Paradesi Synagogue in Mattancherry, Kochi. The second set of copper plates is believed to be the earliest documentation of the history of Jewish trade with India. These plates describe the grant of land and tax privileges by the local Hindu ruler to a church. And oversight of trade in Kollam to West Asian and Indian trading associations. West Asian association included Muslims, Christians, Zoroastrians, as also a group of Jews, who signed in Judeo- Persian and possibly also in Arabic and Pahlavi (Middle Persian). The plates bear their signatures that appear to have been cut into the plates by a local workman unfamiliar with the script, the PMO tweeted. The replica of these plates was made possible with the cooperation of Malankara Mar Thoma Syrian Church in Thiruvalla, Kerala. In addition, Prime Minister Modi also presented Netanyahu a Torah scroll donated by the Paradesi Jewish community in Kerala. Handwritten over a hundred years ago, the scroll had been dedicated to the Paradesi Synagogue in Kochi that had been built in 1568, the PMO tweeted. The Torah is enclosed on wooden staves in a wooden case adorned with silver sheets. And a metal crown covered in gold sheets in floral ornament style, bearing motifs typical of lamps and decorations of south India.